Capricorn Research has to declare an interest here. Pink Floyd’s album ” Atom Heart Mother ” was probably the first time that Uranus and Neptune spoke to a very narrow minded teenager and set him on a journey where Saturn’s limitations would be blown apart on a daily basis. A particularly fond memory is of a first car with a beaten up 8 track stereo which would play 4 different tracks of ” Dark Side of the Moon ” simultaneously. Floyd fans tend to fall into 2 groups, those that identify with the band’s dominant creative figure and songwriter, Roger Waters or with one of the world’s greatest lead guitarists and Floyd’s lead singer, David Gilmour. It’s probably a simple Virgo / Pisces thing but Capricorn Research was firmly in the Gilmour camp. Waters had the Sun in Virgo, he was the writer, the critic and the cynic whose views on life and education particularly brought us ” The Wall “. Gilmour was a Pisces, whose whole approach was through the feel of the music. At 13 and 15 degrees of these two signs, their Suns were in opposition. The balance between these two opposing Suns was what drove Pink Floyd and turned the band into such a phenomenon. And this is the chief thing about planets in opposition – they have to have equal rights. It is the most difficult balancing act, because both are pulling strongly in their own direction and naturally each individual will stand up for their own view of things. It is the same problem when one person has two planets in opposition. It is very easy for the subject to become identified more strongly with one of the planets than the other. Such a bias will cause problems because the neglected planet will continually reassert itself. Most people find it difficult to accept two diametrically opposed parts of their own character. When someone has an opposition, they have no choice. So for Pink Floyd, its a very simple Virgo / Pisces balancing act. If we look at things from a simple Sun sign perspective we could easily get the impression that Waters and Gilmour were not very strong characters. This would be a completely wrong view of things as shown by their Moon signs. Roger Waters has the Moon at the end of Scorpio, one of the toughest and most intense and resourceful placings in the Zodiac. His Moon was opposite Mars, an aspect of a fighter. 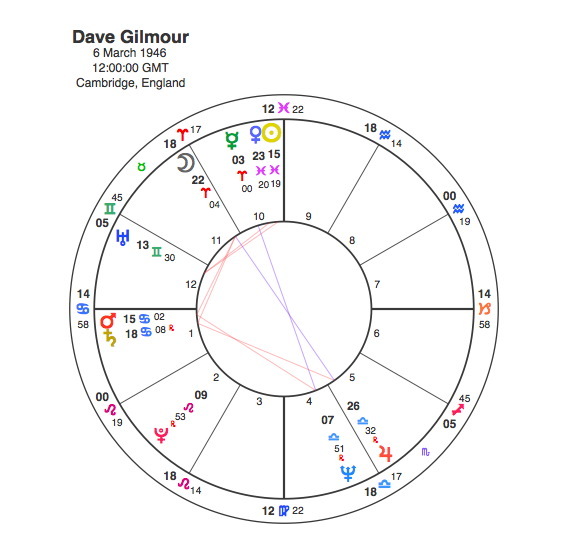 Dave Gilmour has the Moon in Aries in square to Mars. Waters Mars is closely conjunct the rebellious Uranus. Gilmour’s Mars is conjunct Saturn at the apex of a T Square. How these two creative geniuses never resorted to fisticuffs is extraordinary. If their Suns were in more assertive signs they surely would have done. There was no doubt that they both had the muse. This comes from the Mercury / Neptune aspects. Waters had the conjunction, Gilmour the opposition. Pink Floyd was formed in 1965. This was the year that the Uranus / Pluto conjunction in Virgo which was the astrological symbol of the 1960s became exact. It also formed exactly on Roger Waters Sun, the absolute astrological turning point of his life. At the time the band consisted of Waters, Nick Mason, Richard Wright and Syd Barrett. Barrett was the lead vocalist, guitarist and principal songwriter during the band’s early psychedelic years. Over the years there has been much speculation concerning Barrett’s psychological well-being. Many believe he suffered from schizophrenia, and diagnoses of bipolar disorder and Asperger’s Syndrome were advanced. Barrett’s use of psychedelic drugs, especially LSD, is well documented. 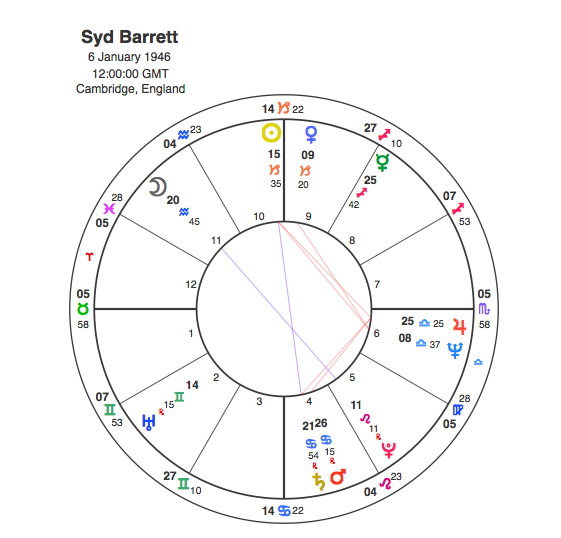 Barrett had the Sun in Capricorn but in opposition to a Mars / Saturn conjunction in Cancer, a difficult pattern that could help explain why some of these diagnoses were put forward. Also his Sun’s square to both Jupiter and particularly Neptune does indicate a powerful attraction to drugs. Jupiter and Neptune, despite being out of normal orbs for a conjunction, have aspects to the Sun / Mars and Saturn that allow both of them to figure as apex planets in a wide T square, thus strengthening their impact on the chart considerably. From 1965 to 67, the transiting Neptune was square to Barrett’s Moon, showing both the creative inspiration of the ” Piper at the Gates of Dawn ” but also the increasing drug use that would cause him to leave Pink Floyd. This all came to a head in April 1968, as the transiting Saturn reinforced its natal relationship with Barrett’s Sun. At this point it had turned the T Square into a seriously difficult Grand Cross by squaring the Sun, Mars and itself whilst also opposing Neptune. After the other band members became sick of Syd’s wandering around on stage, only playing when it suited him and deliberately de tuning his guitar, they replaced him in April 1968 with Dave Gilmour. Roger Waters later said of this episode, Syd ” was our friend, but most of the time we now wanted to strangle him”. For both Waters and Gilmour, 1968 was an astrologically very important year. Jupiter was in Virgo, conjunct Waters’ Sun and opposite Gilmour’s so it was only natural that Barrett’s departure left Waters as the lead figure and creative inspiration for Pink Floyd as Gilmour became the musical inspiration. The rest as the say is musical history and ” Dark Side of the Moon ” remained in the album charts for 741 weeks from 1973 to 1988 and with an estimated 50 million copies, one of the best-selling albums worldwide. Capricorn Research would certainly concur with its ranking as one of the greatest albums of all time. With oppositions however, the creative tensions between Waters’ and Gilmour’s Suns were always likely to cause trouble at some point. Amidst creative differences within the group, Waters left Pink Floyd in 1985, and began a legal battle with the remaining band members regarding their continued use of the name and material. He called Pink Floyd a “spent force creatively”. Gilmour’s view was “I had a number of problems with the direction of the band in our recent past, before Roger left. I thought the songs were very wordy and that, because the specific meanings of those words were so important, the music became a mere vehicle for lyrics, and not a very inspiring one. Dark Side of the Moon and Wish You Were Here were so successful not just because of Roger’s contributions, but also because there was a better balance between the music and the lyrics than there has been in more recent albums “. One big problem that comes from any partnership between two people with opposing Suns, is that at some point one of the slow moving heavyweight planets is going to make a simultaneous square aspect to both of them, creating a T Square and therefore coming between them focusing all those creative differences in a much more challenging and antagonistic way. If there is one planet that is going to cause disruption and separation in a partnership, it has to be Uranus. In 1984 – 5, Uranus was transiting through mid Sagittarius, creating such a T Square between Waters’ and Gilmour’s Suns. The album ” Wish You Were Here “, contained the classic ” Shine On You Crazy Diamond ” a great tribute to Syd Barrett which shows the Waters / Gilmour combination at their best. The title track of the album whilst continuing the Barrett theme, nicely portrays the Waters / Gilmour relationship with beautiful use of the Pisces / Neptune imagery . It contains the line. ” How I wish, how I wish you were here. Swimming, but in opposite directions.